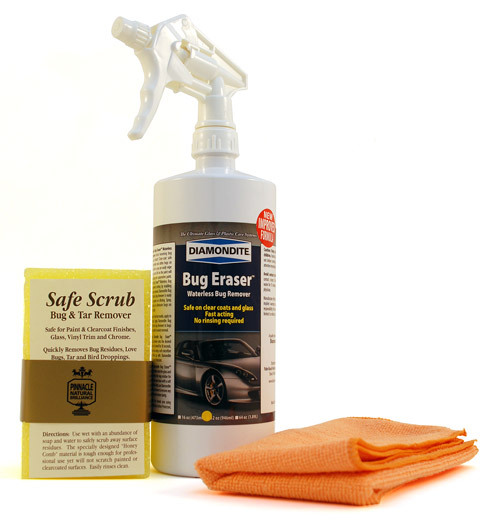 The Diamondite Bug Eraser™ Combo eliminates bugs in three simple steps: spray, scrub gently, and wipe. 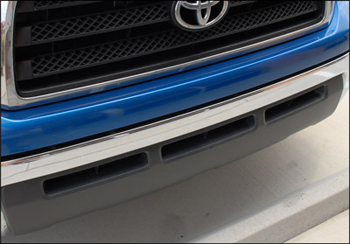 Stubborn insects will lose their grip on automotive paint, glass, metal, or plastics. The Diamondite Bug Eraser™ Combo combines the cleaning power of Diamondite Bug Eraser™ and the mechanical action of the Safe Scrub Pad to remove bugs simply and safely. Step one is Diamondite Bug Eraser™ Waterless Bug Remover, a bug cleaner designed to soften and loosen the insect remains so you can gently rub them away. 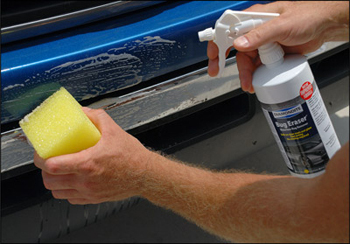 This gentle approach to insect removal spares your vehicle's paint finish any harsh chemicals. If you meticulously maintain your vehicle, you can appreciate the care we took in formulating a bug remover that is safe on auto paint. Diamondite Bug Eraser™ Waterless Bug Remover neutralizes the enzymes produced by bug remains to stop their destructive effects immediately. Apply Diamondite Bug Eraser™ Waterless Bug Remover as soon as you notice bugs on your vehicle to prevent the secretion of enzymes and etching. With a 70/30 blend of polyester and polyamide, the Mango Breeze Microfiber Towel is designed to perform all your cleaning, polishing and buffing jobs. This towel has a double-sided structure: one side has tight loops for cleaning and polishing, the other side is feathery soft for buffing. 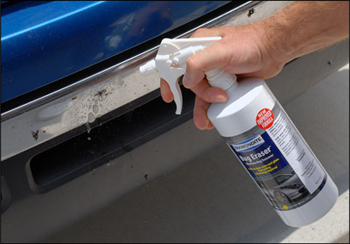 Glass: Spray Diamondite Bug Eraser™ Waterless Bug Remover onto the glass and allow it to penetrate the bug residue for 30 seconds. Rub the area clean with a soft microfiber applicator. 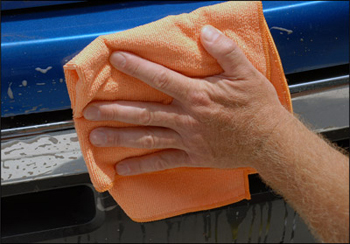 Wipe off the Diamondite Bug Eraser and the insects using the Mango Breeze Microfiber Towel.